Home / BLF Live / BLF 2017 Reports / Saris or Pantsuits? 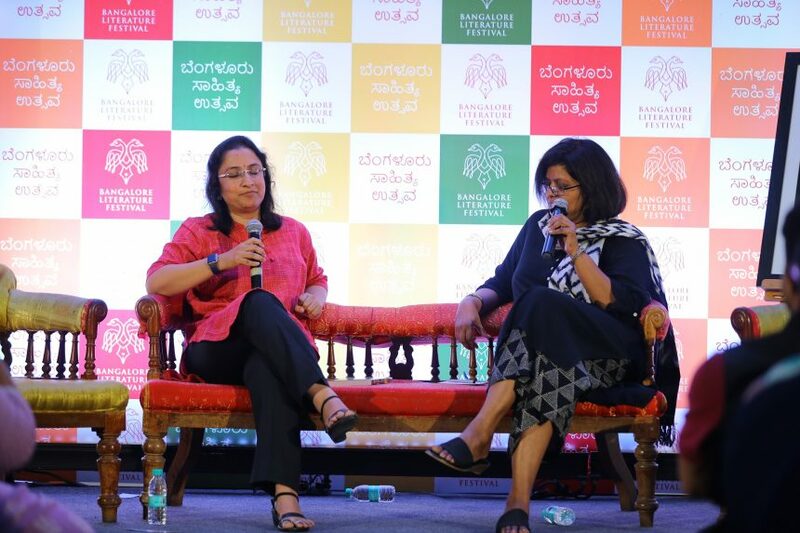 Saris or Pantsuits was a conversation between the author, Radhika Nathan, the writer of ‘The Mute Anklet’, and ‘A Time to Burnish’, and a behavioural science expert, Gayathri who loves studying the impact of perceptions on people. Characterization, Radhika says, comprises of two parts- creation of the lead, one that is done within the mind of the author and is based on archetypes, and experiences. Her characters aren’t very sequential. The other part is representation, where the reader familiarizes with the character, and reacts to the portrayal of the character. This is when the author can easily establish the character with the choice of words, clothes, or even attire. An author must also be mindful of how they want the reader to see the character. Gayathri was also curious about how the names are picked by Radhika. The plot and setting together becomes the backdrop for such details. They are simple, easy names, and did not invoke much thought in her first book. The second book, however, needed thorough consideration. Gayathri held the two books in context to understand how Radhika builds her characters, and how they reach completeness. She says it is fun to build a character with several tools in mind- the character’s body language, choice of words, clothes, looks, and the likes, that give the reader a robust impression of the nuances of the personality of the character. Does she know where her characters will end up in the story line at the very beginning of the novel she’s writing? Yes! Radhika’s novels address fundamental questions. Her first book looked at external perception Vs. individual identity. The second, however, was a journey by itself. This is where clothes, attires, and other attributes define a character and let the reader also know what to expect from the story. These are, however, not stereotypical, but only built on archetypes. It helps to establish a character, and helps the author show his character, instead of only telling the reader what or who they are. Her books have characters that push boundaries, observes Gayathri. Is this drawn from Radhika’s life? In the affirmative, Radhika lets us in on how the reluctant adventurer in her also finds itself as a streak in many a character she has written. Some of her favourite characters in the books may not be the protagonists, but have certainly been given a special place. The session was an insightful look into the working of an author’s mind and what makes them weave characters in certain ways. Saris or Pantsuits, each of them have their own streaks in driving perceptions.